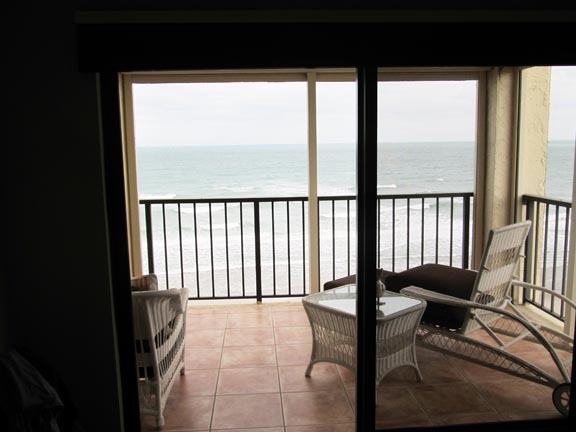 My sister’s beach condo where in January I read Woolf’s book. Storytelling & spirituality in Virginia Woolf’s classic feminist text. A Room of One’s Own by Virginia Woolf. Harcourt, 112 pp. As last year when I was at the beach, where I’ve been for the past few weeks, I remember I should have brought Virginia Woolf’s The Waves, what with the Atlantic surf hissing and breaking outside. Sometimes I feel almost frightened by what a ghost I feel here, so much time alone for memories to flood in of the boy I was and of my past friends, some dead or disabled and most scattered. A few people whom I’ve lost touch with are living quietly here where we grew up, and in my mind’s eye they are still eighteen. I wouldn’t know them if I saw them, yet part of me thinks I’d still be eighteen had I stayed here too. At the same time, the beach is magic—it’s the air, so mild, and the ceaseless murmur of the waves and the sun on the living and moving water. Perfect, really, for reading Woolf, that most retrospective of writers, who wrote often of the sea and of water. And so I reread A Room of One’s Own, which I did bring, and marveled anew at her foresight, her courage, her humor, and her artistry. One might assume that this extended essay, six chapters that make a short book, would be didactic. But I’d noticed before how much Woolf unfolds her essay in scene. For instance, there’s always the track of her mind in a physical place—as she roams a public library or ponders a bookshelf in her home—and there are a series of sexist indignities she suffers while researching the book, which is famous for its dictum that “a woman must have money and a room of her own if she is to write fiction.” This time I noticed Woolf’s caveat about her scenic narrative approach, her “making use of all the liberties and licenses of a novelist” to show her audience how her topic consumed her and how she “made it work in and out of my daily life.” Great novelists are highly sensitive to the murky nature of memory and to the porous border between fiction and nonfiction; Nabokov and Updike made similar statements in their memoirs. In any case, a great move there on Woolf’s part, flagging her method and making her audience complicit in her imaginative approach. And there was at the start of A Room of One’s Own a very specific audience: two women’s colleges at Cambridge University, where Woolf delivered her book in a series of lectures in October 1928. Having been asked to speak on “Women and Fiction,” Woolf tells the story of her process, beginning with being flummoxed by what in the world that topic meant and what to say about something so nebulous and vast. Soon we have her brilliant imagining of Judith Shakespeare, the genius sister she creates for William, and her fate. Which isn’t pretty. Indeed the midsection of A Room of One’s Own makes for uneasy reading by a man, despite Woolf’s ever-present tart humor. For we know those opening incidents might well have happened to her—the world’s great lyrical novelist and avatar of modernism chased off the grass at “Oxbridge” by the Beadle (women had to stay on the paths), then barred from the library (being unaccompanied and without a letter), and then too timid to risk entering the institution’s chapel. Thus she gives us experience along with then-radical ideas regarding the equality of women. And of course this resonates too because we know that Woolf herself wasn’t granted a formal university education by her philosopher father, who instead squandered higher education on her cretinous half brothers. Who’d bullied and molested her. I previously reviewed Woolf’s memoir A Sketch of the Past. Truly. And as Hunter S. Thompson said, “When the going gets weird, the weird turn pro . . .
Me, chuckling, on so many levels. Ah, this is good stuff, Richard. From one pro to another. Thanks, Beth. Good to hear from the piney woods contingent! One of your best, Richard. Your own post, of course, demonstrates the very qualities you burnish in Woolff’s essay. Photo is perfect also. Thanks so much, Shirley. You know, I just noticed that one of your very favorite memoirs on your site’s list is Eudora Welty’s One Writer’s Beginnings. Mine too! But I’d forgotten it WAS a memoir and had forgotten to list it. Fixed that. Have you read her essay “The Little Store”? I think I may have read the Welty essay a long time ago, but I confess details are very dim. Sorry about misspelling Woolf’s last name. I always have trouble with those literary wolves. Darrelyn, this is one of the nicest comments ever. Thank you. It was an uneasy read this time through the essay’s long middle, and I thought how angry it might make me were I a woman. But she goes beyond everything in that final, healing, inspiring chapter. And I stopped worrying about the stray college guy in a women’s studies class reading this book! He’ll be okay, and better for the unease, if the women aren’t too riled up to appreciate the fact he’s even there! Thank you, Susan. I agree, the beach brings things out. The rhythm of the waves and their sound, so soothing. When I was a baby my parents lived on this beach, just a short walk up the beach, and so for me maybe it’s an even more elemental return. I would like to ask Richard, and the rest of you as well, if there is place in reading A Room of One’s Own, to interpret Virginia Woolf as proposing Consciousness precedes Being? I would like to discuss the third chapter of her book along with a small set of texts, each one written from a perspective of consciousness and Being, some with consciousness preceding being, some the other way around. But I do not want to do intellectual injustice to Virginia Woolf’s position and give my students any more reason for wandering in dim or prejudiced directions. Yet, if she is ready to do the work before she has the materials (a room, a job, a pen), then it appears to me, she possesses consciousness before Being. We will read Vaclav Havel and Carl Jung also to present this perspective, and some others to propose the reverse. I am a little familiar with interpretations of Woolf’s “moments of consciousness” and these terms seem to endorse consciousness precedes being but this is not the initial direction of our planned class discussion. What an interesting question, David. I do not see that implication in this text. However, if I were you I’d look closely at her A Sketch of the Past. You may find it there. I am no expert on her, just a fan, but personally I do not find that believe there, as such. I believe that Woolf believed that consciousness WAS being. She writes of her earliest memories, the very earliest being at the beach when she was a baby in her crib, and it’s as if that for her was when she became sentient, became a being. When I reviewed Sketch, I focused on her concept of “moments of being,” and my interpretation of this was, as I recall, that that’s when she/we escape briefly our internal chatter and non-seeing selves and are able to step outside of time. I find it deeply spiritual, though of course Woolf was not conventionally religious and I don’t think she believed in God. She did seem to believe in what I think of as a mystical or Jungian connection with life and perhaps with others. Are you perhaps considering the existentialist position of “existence precedes essence?” I’m not sure I see a difference myself between “consciousness” and “being,” since oh well, I’m getting all tangled up in various philosophies now! Thanks so much for the reply! I agree with you that in some ways she seems to make consciousness (shadowoperator calls it “essence” but I believe it to refer to about the same thing) and being the same thing. But in that case, consciousness would then depend on being, making Being the antecedent. But I’m not sure that would be consistent with A Room of One’s Own. If the genius of the consciousness already possessed by Shakespeare’s sister, needs only a physical space (Being, Existence) to find expression, then would consciousness not precede the being? I will look more closely at A Sketch of the Past for clues. I don’t mind considering her writing in this way even if it was not her precise intention to make any proposition about Being and Consciousness but I would not like to ask the question that would offend her intent. Our discussion about all of this will be open and Socratic, so it might go any direction. But I would despise a position that imposed on Virginia Woolf a “belief” she opposed. P.S. The standard existentialist line is “existence precedes essence,” which is where part of my confusion with the ideas you are expressing comes in. Yes, sorry I got those mixed up. I am not thinking Woolf intended to establish a position on this either way. But if what she says is consistent with either position I can still use it in our discussion. It seems clear she at least suggests the physical culture provides the expression of abilities, potentialities, impulses that existed prior to the acquisition of a “room”. Or not? I don’t know. I’m thinking that with Woolf’s general impressionism in her works (or do I mean expressionism? Oh, dear, I’m tangling things up further! ), that for her as a creating being, “consciousness” and “being” were contemporaneous, whereas she had to wait for a space to write it all down in, in which case you’re correct that in that respect at least she had the mental wherewithal previous to the material wherewithal. How does that sound? Victoria and David, you two have left me in the dust! But I did remember something David may be referring to in A Room: the part where she tells the young women they can resurrect Shakespeare’s (fictional!) sister by writing. Or some such. It seemed very slippery, and she didn’t dwell on it. This is all very interesting and I thank you all for taking the effort and the time to help me. I am thinking as we have not eliminated the possible reading in the way I was initially planning, I will go ahead with it and see what my students come up with in our dialogue. I can work with either conclusion! Thanks again and I have the feature selected so I receive e-mail notice if someone adds to this thread so I’ll come back if there are more ideas along the way. Nice talk and thanks again! David, you and Richard are the ones who are truly generous, you for sharing something from your daily work in the field, Richard for providing the framework and the additional insights, and for tolerating my wordiness on his site. You two make a killer team! I really enjoyed this post, Richard. It definitely makes me want to return to Room and explore it all over again. I have had occasion in recent months to reread some lit texts with my daughter that I hadn’t read since high school. I had layers of epiphanies, not the least of which was just how differently and deeply the stories resonated with me as an adult with years of life in tow for the words to ping off of. Our different reactions made for interesting conversations with my daughter! I know, rereading is so rich. Literature seems wasted on the young sometimes, but it does plant seeds. Here is the only recording of Virginia Woolf’s own voice. Thought of you:https://www.youtube.com/watch?feature=player_embedded&v=E8czs8v6PuI#! Neat! Thank you for sharing this, Shirley. I’ve seen your photo and replies on Shirley Showalter’s blog frequently, so I decided to poke around in your blog. Great design and content. And just about the right amount of scholarliness for an English prof, I’d say. 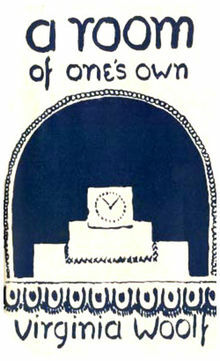 Virginia Woolf’s A Room of One’s Own is a favorite to read and teach. But I also like her essays on the London Scene: Abbeys and Cathedral. As I re-read her comparison/contrast of St. Paul’s and Westminster Abbey, details of these towering giants stand out in bold relief. I can hear the shimmer and smell the grandeur. Thanks so much, Marian. I am glad you like Woolf and help keep her alive. She is such a hero to me, and such a great writer!